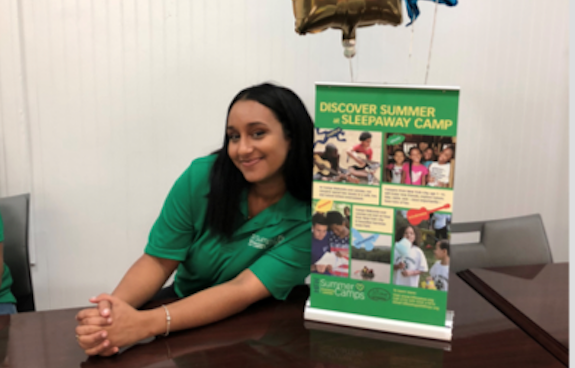 The first session of HFH Summer Camps 2019 begins on June 28, but camper recruitment efforts are already underway for the summer, when hundreds of New York City kids will enjoy a free sleepaway camp experience. Paola Rodriguez, Camp Registrar for HFH Summer Camps, is responsible for coordinating the team of Camp Recruiters that help families to navigate every aspect of camp attendance, from ensuring that families meet application deadlines to accompanying campers on their way to and from Camps Lanowa and Wakonda in Harriman State Park. 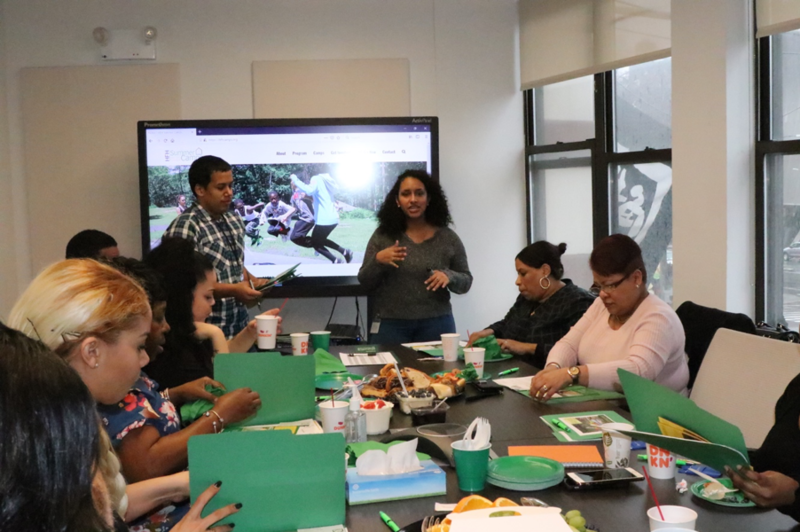 Camp Recruiters travel to homeless shelters throughout New York City, where they present on the camps experience to families and staff. These information sessions are critical to spreading the word and building excitement about HFH Summer Camps. Most children participating in HFH Summer Camps have never had a sleepaway camp experience before, and these information sessions are also a chance for Camp Recruiters to answer any questions and assuage parents’ concerns. Rodriguez has worked in camper recruitment for four years, and over this time, she has learned to address parents’ common concerns while bringing attention to the unique features of an HFH Summer Camps experience. For example, the opportunity for kids to interact with international staff. Part of Rodriguez’s appreciation for the staff’s diverse backgrounds stems from her own international experience as a teenager. At 17, she spent two weeks at an international school in Senegal through a school program. She credits the experience with sparking her interest in education and youth outreach. Shortly thereafter, Rodriguez applied for a Camp Counselor position with HFH Summer Camps. She was asked to consider a Camp Recruiter position instead due to her bilingualism and strong interpersonal skills. Rodriguez was promoted to the role of Camp Registrar after three years working as a Camp Recruiter and one year working as a Senior Camp Recruiter. She also spent one year working as an Afterschool Teacher at Prospect Family Residence. Jeffrey Tucker, Director of Camp Operations, notes that Rodriguez’s extensive experience gives her an exceptional foundation for cultivating the vital relationships HFH Summer Camps maintains with the many partner shelters who refer families to camps. “Paola has a keen eye for detail and has been instrumental in building great relationships with the many homeless shelters we partner with in order to provide an amazing camp experience to our kids,” he says. All children participating in HFH Summer Camps are experiencing or have previously experienced homelessness, which Rodriguez notes can add unique challenges to the application process. Camp Recruiters are responsible for ensuring that these complexities don’t interfere with a child’s participation in HFH Summer Camps. Over the course of her four years working in camper recruitment, Rodriguez has also learned to address parents’ individual concerns with patience and a personalized touch. 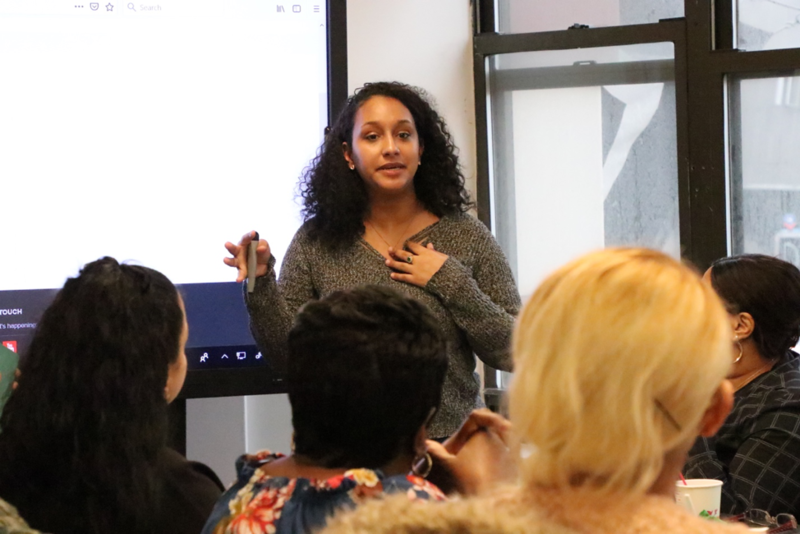 In addition to her role as Camp Registrar, Rodriguez was recently accepted into Hunter College, where she plans to pursue a bachelor’s degree in women’s and gender studies. She has already received her associate degree in education from Bronx Community College. “In this organization, I was able to grow and learn things that I didn’t know throughout the four years that I’ve been working here,” Rodriguez says, noting that she began working for HFH Summer Camps while transitioning from high school into her first semester in college. In the future, Rodriguez intends to continue working in education and youth outreach. In the context of HFH Summer Camps, Rodriguez notes that participation not only enriches kids’ summer vacation, but also acts as a springboard for connecting their families with the services and programs available to them. One of her most memorable moments as a Camp Recruiter came when she helped to facilitate a family’s access to health insurance, which is a prerequisite for participation in HFH Summer Camps. Rodriguez’s experience with the child’s family exemplifies the personalized and proactive approach to problem-solving she has applied throughout her four years working in camp recruitment.